Medicinal ingredients: Each lozenge contains: Menthol (Mentha x piperita leaf) 2.0 mg, Extract of Ricola’s herb mixture 34.15 mg: peppermint (Mentha piperita) aerial part 8.54 mg [1.33:1, QCE 11.36 mg], lemon balm (Melissa officinalis) aerial part 8.54 mg [1.33:1, 11.36 mg], thyme (Thymus vulgaris) aerial part 5.10 mg [1.33:1, QCE 6.78 mg], sage (Salvia officinalis) aerial part 4.61 mg [1.33:1, QCE 6.13 mg], hyssop (Hyssopus officinalis) aerial part 4.61 mg [1.33:1, QCE 6.13 mg], elder (Sambucus nigra) flower 0.85 mg [1.33:1, QCE 1.13 mg], linden (Tilia cordata) flower 0.85 mg [1.33:1, QCE 1.13 mg], wild thyme (Thymus serpyllum) aerial part 0.35 mg [1.33:1, QCE 0.47 mg], horehound (Marrubium vulgare) aerial part 0.35 mg [1.33:1 0.47 mg], mallow (Malva sylvestris) leaves 0.35 mg [1.33:1, QCE 0.47 mg]. almond), black carrot juice, hibiscus extract. Recommended use or purpose: For the temporary relief of coughs and sore throat. Dissolve one lozenge slowly in the mouth every 1 – 2 hours up to a maximum of 10 lozenges per day. If symptoms are severe or persist for more than 2 days or accompanied by high fever consult a doctor. Hypersensitivity / allergy is known to occur, in which case, discontinue use. Medicinal ingredients per lozenge: Menthol 1.8 mg, extract of Ricola’s herb mixture 30.55mg [peppermint herb (mentha piperita) 7.65 mg [1.33:1, QCE 10.17mg], lemon balm herb top (melissa officinalis) 7.65 mg [1.33:1, QCE 10.17 mg], thyme herb top (thymus vulgaris) 4.56 mg [1.33:1, QCE 6.06 mg], sage herb top (salvia officinalis) 4.12 mg [1.33:1, QCE 5.48 mg], hyssop herb top (hyssopus officinalis) 4.12 mg [1.33:1, QCE 5.48 mg], black elder flowers (sambucus nigra) 0.76 mg [1.33:1, QCE 1.01mg], linden flowers (tilia cordata) 0.76mg [1.33:1, QCE 1.01 mg], wild thyme herb top (thymus serpyllum) 0.31 mg [1.33:1, QCE 0.41 mg], horehound herb top (marrubium vulgare) 0.31mg [1.33:1, QCE 0.41mg], high mallow leaves (malva sylvestris) 0.31mg [1.33:1, QCE 0.41mg]. Non-medicinal ingredients: sugar, glucose syrup, honey, malic acid, sour cherry juice, natural flavours (honey, cherry, almond), colorants (black carrot juice, hibiscus extract). Dosage / Duration: adults and children over 12: dissolve one lozenge slowly in mouth every 1 – 2 hours from min. 3 up to max. 10 lozenges per day. Consult a doctor if symptoms are severe or persist for more than 2 days or are accompanied by high fever. Consult a doctor prior to use if pregnant / breastfeeding, or if you have gallstones or anemia. Hypersensitivity / allergy is known to occur, in which case discontinue use. Consumption with alcohol, other medications or health products with sedative properties is not recommended. Some people may experience drowsiness. Exercise caution if operating heavy machinery, driving a moto vehicle or involved in activities requiring mental alertness. Do not purchase if package is opened. 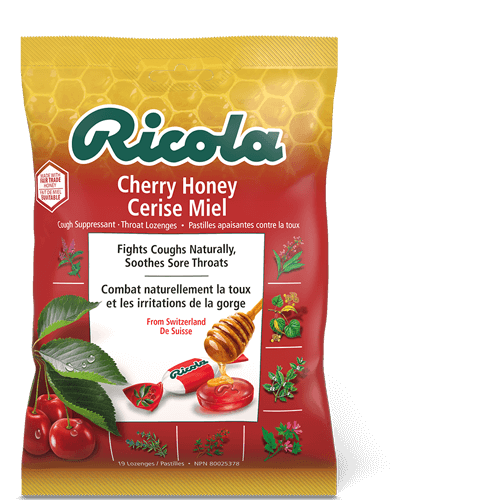 Ricola Cherry Honey is the sweet way to soothe your sore throat. It brings together two flavors from nature to create one great tasting drop. Refreshing natural cherry flavor with rich comforting honey. And just when you think it can’t get better, we add-in our famous Swiss mountain herbs. 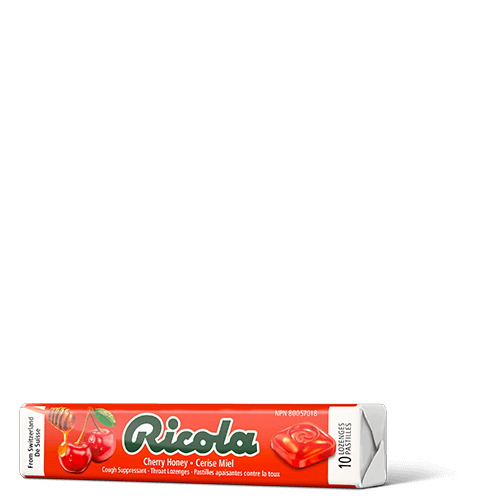 Ricola helps you to keep your voice sounding strong and refreshed even when you have a sore throat. Find out more. We all need our voices.